MGM Resorts International has been the best-performing gaming stock to own in 2014, at least in terms of being the stock with the least losses in 2014. While most companies in the industry were getting hammered on poor performance in Macau -- including Las Vegas Sands and Wynn Resorts , which have major bets there -- MGM was doing better thanks to a resurgence in Las Vegas. We don&apos;t know what MGM&apos;s stock will do in the future, but as we head into the new year, here are three reasons MGM Resorts could thrive in 2015 and beyond, which could push the stock higher. 1. Nongaming growth in Las Vegas, particularly in hotel revenueMGM is the biggest player in Las Vegas by net revenue and is the companythat collects the biggest percentage of its overall revenue from Sin City. In fact, thanks to an increase in its Las Vegas property revenue, MGM alone among these three major casino companies reported higher total year-over-year revenue in its latest reported quarter. Coming into 2015, nongaming revenue from sources such as entertainment and convention space will increasingly join gambling revenue in helpingcompanies win in Las Vegas. For MGM, hotel revenue is proving to be especially lucrative. In the most recent quarter, MGM posted revenue per available room (RevPAR) growth of 6% at its Las Vegas properties, ahead of previous guidance. This marked the eighth consecutive quarter of rising RevPAR there. The company gave guidance of 5% RevPAR growth for the fourth quarter, but it wouldn&apos;t be surprising if that also proved an underestimate. This growth is helped by the company&apos;s investments in upgrading its Las Vegas properties in 2014, including the Mandalay Bay remodeling that was completed last quarter. MGM has 11 major properties in Las Vegas, more than any other company. Following the renovation work the company did in 2014, MGM management has said that they will now focus on increasing rates in 2015 to drive even higher RevPAR growth. 2. New properties in the U.S. NortheastThe U.S. gaming industry outside of Las Vegas is starting to look better, at least partly driven by the risingU.S. economy coupled with higher consumer confidence and spending. Consumer spending rose about 2.2% in the third quarter, and analysts expect that figure to reach 2.5% for the current quarter and about 3% in 2015. This is good news for casino companies that rely on disposable income and consumer confidence to get gamers in the door and willing to play. MGM is making a big bet on this U.S. growth by increasing its presence in the U.S. Northeast with planned new resorts in Maryland and Massachusetts. MGM is constructing its newest resort in National Harbor in Maryland. It will include about 4,000 slot machines on its massive 1.7-million-square-foot property. The company is also finalizing plans for a Springfield, Mass., resort to start construction in 2015. Nomura Securities predicts these two casinos, along with a new casino in China, could drive up MGM&apos;s total annual EBITDA by 56% to over $3.5 billion in the next three years. Neither U.S. project will be complete until 2016-2017, but analyst interest and news of their progress could push up MGM stock --even in 2015, one to two years ahead of their planned opening. 3. 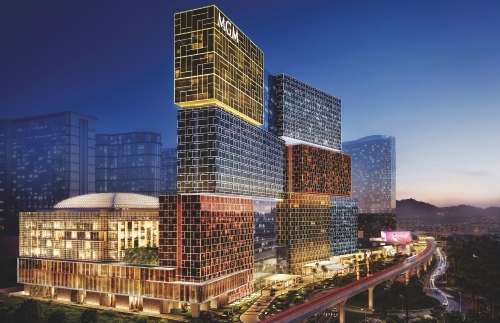 Macau poised to pick back upMeanwhile, MGM is still making a big bet on Macau. In terms of total gaming revenue and profit, Macau remains hands-down the gaming mecca of the world. Even following declines in 2014 as the VIP segment has been hammered, total gaming revenue in Macau is still six times as high as that of Vegas. Macau provides roughly two-thirds of revenue for both Las Vegas Sands and Wynn Resorts. While MGM&apos;s revenue from the Chinese special administrative region is much smaller than its two peers&apos;, the company nonetheless is seeing a rise in profits from its Macau properties. The company is upping its bet in Macau with a new propertyunder construction and slated to open in 2016. While MGM&apos;s Las Vegas revenue rose in the third quarter while its China revenue dropped, the company 12% EBITDA year-over-year growth in Macau was actually higher than its corresponding growth in Vegas.And while the VIP segment decline is draining Macau&apos;s revenue growth, the rise in the mass market there is why MGM CEO James Murren said in the most recent earnings call that"We continue to believe in the long-term future of Macau." Rendered view of what MGM Cotai will look like. Source: MGM Resorts. MGM&apos;s upcoming $2.9 billion resort on Macau&apos;s Cotai Strip is slated to open its doors just months after Las Vegas Sands and Wynn Resorts each open their own new resorts nearby. The progress of the coming MGM resort in Macau. Photo by author, September 2014. Macau&apos;s declining revenue in the last few months has led to a massive sell-off in the casino industry, particularly for the companies with the biggest investments there. But the mass market segment remains a strong source of revenue going forward. With MGM&apos;s new property slated to open in a country that is already proving more profitable for the company than the U.S., this could mean much bigger profits soon. Add in MGM being the best bet on the Vegas comeback and its new properties coming to the U.S. Northeast, and this stock could be poised to rise. The article 3 Reasons MGM Resorts International Stock Could Rise originally appeared on Fool.com.